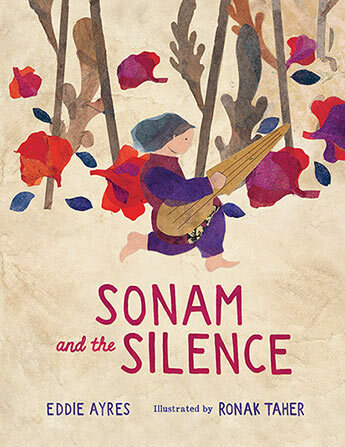 In Taliban-ruled Afghanistan, Sonam's world is dark and silent. Then one day, she follows a magical melodious sound to a walled garden, and her world is silent no more. The sound is music, and it lifts her up amongst the stars and takes her deeper than the tree roots in the earth. How can she hold on to this feeling in a world where music is forbidden? Eadric Ayres is named after Eadric the Wild, a resistance fighter in England after 1066. Eadric grew up in England, studied music and has adventured throughout the world as a viola and cello player. After working in an orchestra in Hong Kong, he decided to cycle from England back to Hong Kong (that's 16,000 km), took a little violin with him, and played to Greek shepherds, Iranian police and Chinese truck drivers along the way. Eadric's big desire in life is to introduce classical music to as many different people as possible, so for ten years he worked as a broadcaster with the ABC, ultimately presenting the popular breakfast programme. Eventually Eadric's adventurous spirit demanded more, and he moved to Afghanistan to teach music there for a year. Eadric was born Emma, and transitioned just before his fiftieth birthday. Ronak Taher is an Iranian-Australian artist born in 1984. She finished her bachelor of Graphic Design at the University of Tehran, also holds a Master of Illustration and Animation from the Azad University of Tehran. In 2013 she was celebrated as one of the 300 upcoming world talents in film industry at the Berlin Film Festival. Ronak also works in the fields of graphic design, illustration and sculpture. She has had over six solo and group visual art exhibitions and has illustrated more than eight books for children and young adults.